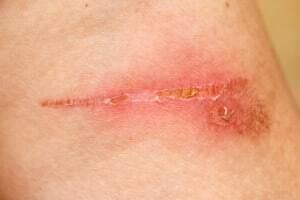 Skin burns and damage to the underlying tissue can create severe repercussions when not properly treated. Extreme second-degree and third-degree burns require immediate medical attention at the emergency room at a local hospital or burn center. In fact, burns to the hands, feet, face, or genitalia can create lifelong disabilities, disfigurement and a high risk of infection. Numerous types of energy including thermal (heat), electrical, radiation and chemical reactions can cause burn injuries. A scalding burn is often the result of skin contacting steam, hot water, or other hot liquid. Applying minimal treatment, many burns will heal properly without issue. However, often times achieving the best cosmetic outcome from a moderate to severe burn depends highly on appropriate care applied within the first few days following the burn. Burns are classified in three specific categories: first-, second-, and third-degree. The level, or degree, of the burn to the skin and underlying tissue will determine the best treatment to ensure the body heals properly. A first-degree burn typically affects the outer layers of the skin. Nearly everyone will experience a first-degree burn at some point happening as a result of daily activities. This type of burn is usually associated with minimal pain, along with red and discolored skin. A second-degree burn affects the skin's outer layer along with the layers just below the surface. Typically, second-degree burns produce minor and major blisters, intense, swelling skin, red blotches and throbbing pain. Many sunburns produce second-degree burns, blisters and pain. A third-degree burn can cause severe damage to every layer of the skin. Often times, the burn can penetrate deep through the skin into the muscles and fat, and even burn bone. Third-degree burns often produce white appearing skin or black charred skin that often times dries the skin out completely. Black charring is often an indicator that the burn has penetrated well past the first layer of skin. Any type of third-degree burn requires immediate medical attention at the emergency room, or burn center. Both first-degree and second-degree level burns tend to be minor when treated properly. If no blisters have formed but the skin appears red on the surface, it is often classified as a mild burn. Applying burn ointment or aloe vera gel can usually provide enough relief to minimize the searing pain or burning heat that often accompanies a mild to moderate burn. Often times, over-the-counter (OTC) pain relievers are required to minimize discomfort. Managing pain is often complex and requires continuing assessment by doctor that specializes in burn treatment. Often times, multidisciplinary approaches are required to manage the pain. This includes proper management of prescription drugs and non-medicating treatments provided by physical therapist and/or psychologists working in unison with the physician. Sometimes even small burns can create severe pain. Burn doctors will help manage the pain from burns by controlling the intensity. The doctor often determines the level of pain whether it be acute, breakthrough, chronic, resting or neuropathic pain. Treatment plans are often based on whether the pain is acute (short-term, intense) or chronic (ongoing) in nature. The doctor will also work to manage the prescription medications and other associated medical conditions including anxiety, depression, insomnia, or activities that increase the level of pain. 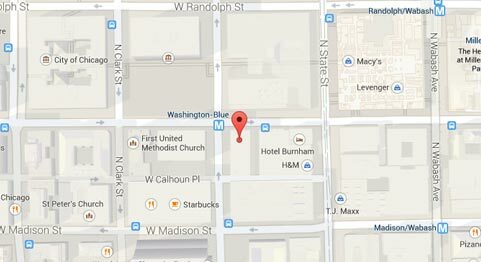 Visit our Chicago burn accident page here.